The mood is relaxed, the water is cool and the Thai sun is hot upon your skin. You’re thirsty, but you don’t want to head inside to the restaurant. The solution? 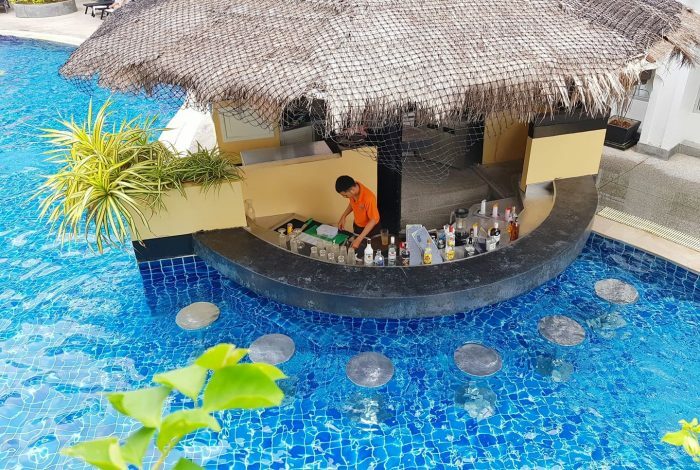 Order a smoothie or an icy beer from our swim-up bar. Shady seating areas, shimmering waters and the thatched tiki roof of the Pool Bar add to the paradise atmosphere of our 3rd-floor swimming pool. When you get hungry, treat yourself to healthy bar snacks or a light lunch on your sun lounger. Later on, poolside cocktails are the ideal way start to your evening festivities.